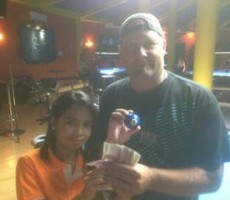 THURSDAY 9 BALL GRAND FINAL : PEN WINS. 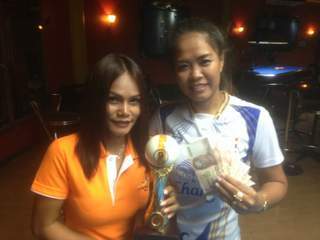 Congratulations go to Pensri Teal (A) from Thailand for winning our Thursday 9 Ball Grand Final for Season 13 last Saturday night. 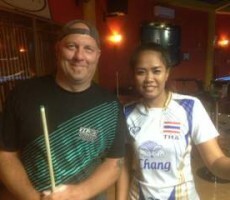 From the maximum entry of 16 players, she defeated Jeff Schmitt (A+1) from The USA in the final of the Double Elimination event to take home the 1st prize of 10,000 baht. Pen and Jeff both played very well throughout the evening, but with Pen having qualified for the final through the “One Loss” side of the draw, she would have to beat Jeff twice in the final (race 3-5), to lift the trophy. After leading the first set 2-0, she just managed to scrape over the line in the deciding rack after Jeff had won 4 consecutive racks to make it “hill hill”. 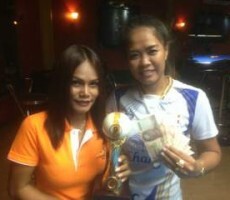 The second set was slightly more comfortable, and she sealed victory in the 5th rack to claim the title by 3 racks to 2. Her handicap now moves up to A+ as a result of her success. 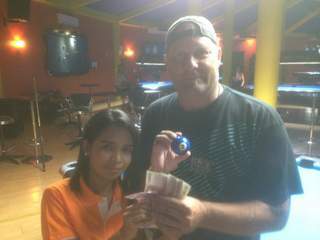 Jeff received the Runners-Up prize of 5500 baht, and his handicap is also increased to A+2. Jimmy Schmitt (A+2) from Germany performed well to finish in 3rd place, collecting 4000 baht, with Andy Zahlan (A+1) continuing his recent run of consistency to gain 4th place and 2500 baht. 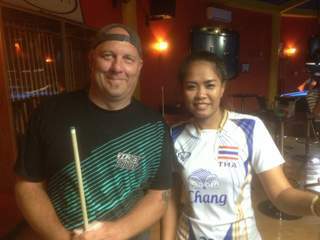 In equal 5th place were Megabreak’s own Barrie Sherman (A+7) and John Weber (A+2) from Israel, each receiving 1500 baht, and the other money winners on the evening were Hakan Ekberg (A+6) from Sweden and Nittha Punsuk (A) from Thailand, who each took home 1000 baht for finishing in equal 7th place.